This duet ranks up to being one of my favorite Kandi Steiner reads. It delivers all the angst and feels that it promises... and more. The insight into Charlie’s inner turmoil really hits home. Kandi absolutely nailed the thoughts and feelings that Charlie struggled with on a day to day basis in attempting to make that big decision, a life-altering one. We learn more about Cameron and this past, what he is feeling, and to what lengths he will go to mend the tear in his marriage. He works very hard to right his wrongs. I absolutely fell in love with him. His love is deep and steadfast. It’s tender and thoughtful. Charlie has an enormous and painful decision to make ad I was not disappointed with her decision. Kandi Steiner got it just right! I’m so glad I got to read and review this duet and will definitely add it to my recommendations!! 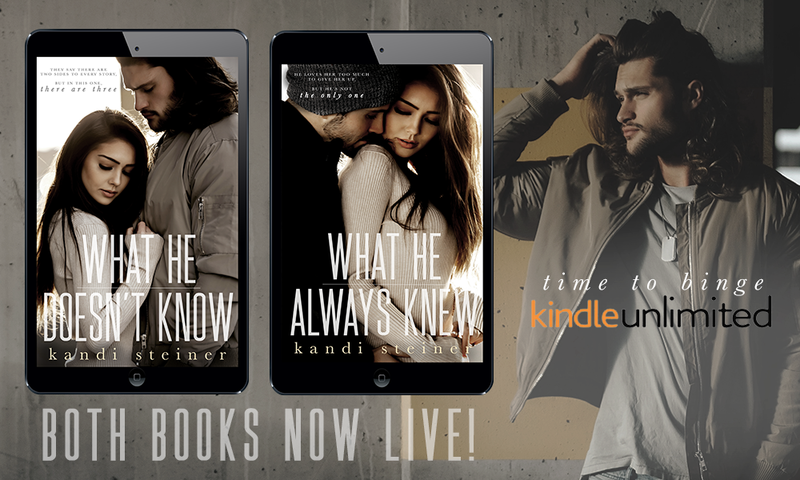 Start the Series today with book one, What He Doesn't Know!